Our meeting took place in the context of worship, fellowship, and prayer during the first week of Epiphany. Archbishop Beach began our time together during the opening Eucharist teaching about the grace of God evidenced in the miraculous star that led the Magi to Jesus. The contrast between the Magi and the shepherds couldn’t have been more stark, yet God calls all to his service. Our primary work this week has been the approval of liturgies for the 2019 Prayer Book. That was followed up with conversations about womens’ ministry, discerning the admittance of two new members to the College, and receiving reports from around the Church, including updates on our ecumenical dialogues. All the discussions were in the context of fulfilling our Gospel mandate to reach North America with the transforming love of Jesus Christ. At the beginning of the 21st century, global reassessment of the Book of Common Prayer of 1662 as “the standard for doctrine, discipline and worship” shapes the present volume, now presented on the bedrock of its predecessors. Among the timeless treasures offered in this Prayer Book is the Coverdale Psalter of 1535 (employed with every Prayer Book from the mid-16th to the mid-20th centuries), renewed for contemporary use through efforts that included the labors of 20th century Anglicans T.S. Eliot and C.S. Lewis, and brought to final form here. The Book of Common Prayer (2019) is indisputably true to Cranmer’s originating vision of a form of prayers and praises that is thoroughly Biblical, catholic in the manner of the early centuries, highly participatory in delivery, peculiarly Anglican and English in its roots, culturally adaptive and missional in a most remarkable way, utterly accessible to the people, and whose repetitions are intended to form the faithful catechetically and to give them doxological voice. * Daily Office LectionaryThe BCP texts as now finally approved will be put online at AnglicanChurch.net by mid-February under a new Book of Common Prayer tab.At the conclusion of the liturgical approval process, we stood in unison to praise God and to thank Archbishop Duncan and the Liturgy Task Force for their sacrificial work on this historic resource. 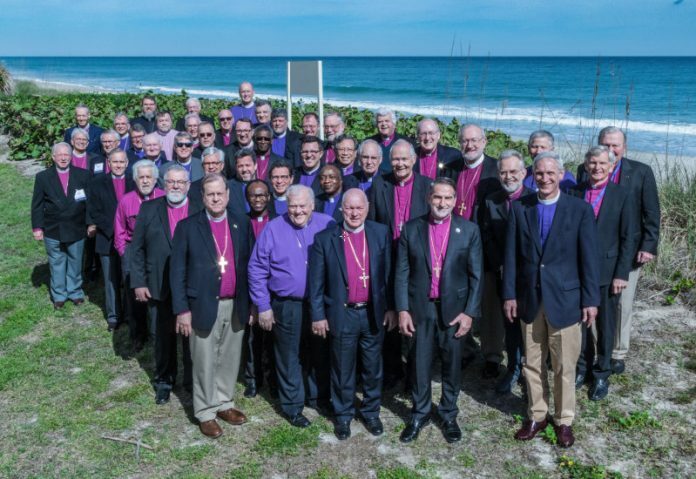 The Bishops’ Working Group on Holy Orders, co-chaired by Bishop Clark Lowenfield and Bishop Jim Hobby, facilitated the next step of our conversations regarding holy orders and the ministry of men and women. When we met previously in Victoria, Canada (September 2017) to discuss this topic we acknowledged that “we have not effectively discipled and equipped all Christians, male and especially female, lay and ordained, to fulfill their callings and ministries in the work of God’s kingdom. We repent of this and commit to work earnestly toward a far greater release of the whole Church to her God-given mission.” In light of this reality, we thought a good place to start was to listen. There were powerful presentations by a number of women about their experience and observations about ministry from their perspective. The presentations were very well received and are linked here. On Thursday, January 10, 2019, we met prayerfully to consider the inclusion of two new bishops in the College. We give thanks for the people of Prince of Peace Anglican Church in Viera, Florida, who graciously hosted us. We consented to the election of the Rev. Andrew Williams as Bishop of the Anglican Diocese in New England and admitted Bishop Todd Atkinson of Via Apostolica and the Anglican Network in Canada.In addition to carrying on the continuity of Diocesan ministry, we are excited that we continue to be a “gathering group” that is uniting those of Anglican faith and practice. We are thankful for the extraordinary work that Via Apostolica is doing in reaching young leaders. You can learn more about these elections here and here. Archbishop Beach shared with the College that, after a time of personal prayer and discernment, he has decided to allow himself to be considered for a second term in office. Prior to Assembly 2019, the College will meet in Plano, Texas, June 13-16, 2019 to discern the Lord’s will for the election of the Archbishop. Please keep Archbishop Beach and the College of Bishops in your prayers as they enter this process. All of our prayers and discussions have taken place with our eyes on the Gospel mission to which we have been called. Even with the weight of administrative work that has to be done, we seek to keep our mission priorities uppermost in our minds. Just as the Star of Bethlehem led the Magi to Jesus, God continues to draw the unbelieving to himself through means and methods that we would not have imagined. We are excited to be numbered among those being used by the Lord for his purposes. We continue to pray for the Holy Spirit to empower our Gospel witness and enliven our discipleship, that we might reach every people and language and nation in North America with the transforming love of Jesus Christ.